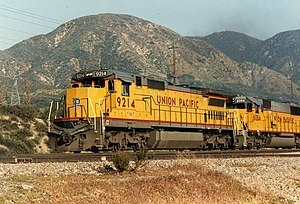 UP 9214, a C40-8, leads an eastbound train up California's Cajon Pass on May 10, 1991. The GE C40-8 is a 6-axle road switcher diesel-electric locomotive built by GE Transportation Systems between 1987 and 1992. It is part of the GE Dash 8 Series of freight locomotives, and its wheel arrangement is of a C-C type. This locomotive model is often referred to as a Dash 8-40C or simply "Dash 8". "Dash 8" in general refers to the electrical control series, "Dash" being a carryover from the older syntax of C40-8. The "40" refers to the baseline horsepower rating (4,000 hp or 3,000 kW) of the unit, although some units may be re-rated to 4,100 hp (3,100 kW) (see below). Later units were supplied with a wide-nose cab and are designated Dash 8-40CW, the "W" indicating a wide-nose cab. Some railroads, in particular the Chicago and North Western, upgraded some of their units to ~4,135 hp (3,083 kW) and designated them as C42-8. This designation was modified by Union Pacific to C41-8 after its takeover of C&NW in 1995. Former C&NW units are usually identified by a grab-iron on the front nose just above the Union Pacific shield logo, and/or the "C41-8" designation on the cab side. The final three C&NW C40-8s were built with 4,135 hp (3,083 kW), and the prior 32 units were similarly modified as well. Although none of these units were ever officially classed as C41-8 by GE, a safety cab version was built as the Dash 8-41CW. Canadian National 77 2000-2041, 2100-2134 All 77 units were originally bought by CNW. Sold by UP. Citicorp Railmark, Inc (CREX) 42 9023-9064 Originally bought by CNW. Sold by UP. Sold to CN. Conrail 25 6025-6049 Split between CSX & NS. All units remaining in Conrail colors are retired. CSX Transportation 136 7500-7646 Classed as C40-8. 7489-7498 are ex Conrail. All retired from May 2016 to February 2017. Most have been sold off to other railroads or have been scrapped. Norfolk Southern 89 8300-8313, 8689-8763 8300-8313 are ex Conrail. All units were to be rebuilt with a new wide cab, upgraded electronics, etc. 8500-8504, 8506-8513 being rebuilt with an NS "Crescent" nose/cab (The same on the SD60E's), 8505 being rebuilt with a GE widenose & cab. They are classified as a Dash 8.5-40CW but are labeled as D8.5-40CW. However, due to repeated failures, all Norfolk Southern C40-8's will be sold or scrapped, and 47 new ET44AC and 3 ES44AC locomotives will replace them. Last remaining units retired in 2017. Union Pacific Railroad 257 9100-9355, 9185 (2nd) 9185 (1st) returned to GE, became testbed. As of early 2019 all units have been sold/auctioned off. Classed as C40-8; all ex-CSX. 7489 is ex-Conrail. The companies that still own C40-8 locomotives as of 2006 include: CSX Transportation with 146, Norfolk Southern Railway with 88 and Union Pacific Railroad with 298 (includes former C&NW C41-8 units). Also, the GE C40-8W is a newer model of the C40-8. The W stands for "Wide-nose" or Safety Cab. Many railroads such as CSX, UP and BNSF still own or use these models. The shape of the C40-8Ws no longer have the stub on the front. The nose has been stretched out. Many railroads like CSX have the two head lights on the nose, while Conrail units which GECX (formerly CSX) and Norfolk Southern now own, had C40-8Ws with the head light on the top of the cab and marker lights mounted on the nose directly above the numberboards. Many CSX and NS engines still sport the "Ex-Conrail" head light configuration. In 2010 CN bought 35 C40-8 locomotives (2100-2134) from UP and 67 C40-8W locomotives (2098-2099, 2135-2199) from BNSF. Another 42 C40-8s were bought by CN in 2013 (these 42 units are numbered between 2000-2041) marking all 77 of the ex CNW Dash 8-40Cs now owned by CN. CN has 6 C40-8s that were painted for the 15th anniversary and they were numbers 2107, 2112, 2113, 2115, 2124, and 2128. In 2016, Pan AM bought 20 C40-8 locomotives (7489, 7517-7518, 7523, 7528, 7534-7535, 7541-7542, 7545, 7552, 7561, 7585, 7605, 7609, 7620, 7622, 7627, 7635, 7643) from CSX. And In 2017 Pan Am Bought 4 More C40-8's, 7500, 7575, 7594, & 7595. As of early 2019 Pan Am Railways has painted units #'s 7518, 7552 & 7635 into their Phase 3 paint.